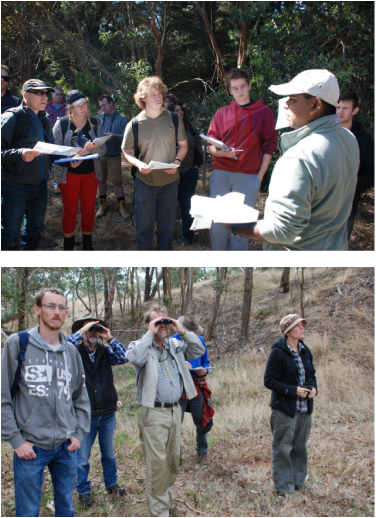 Students from the Landscape Restoration and Mine Rehabilitation course at Federation University are monitoring plant growth and mortality at the biorich plantation in the mining buffer zone owned by multinational kaolin mining company, Imerys. Federation University is one of a number of partners in the biorich project. Others include Imerys Minerals, Australian Forest Growers, the Federal Government’s Caring for Our Country program, Central Highlands Water, Corangamite CMA, Koala Connect and Moorabool Shire Council. Bird survey monitoring has taken place for almost three years. Bird species richness and abundance act as indicators of whether or not biodiversity is increasing as a result of the biorich pantation. Ornithologist Tanya Loos has led 20 surveys on a bi-monthly basis, following a transect developed in association with BirdLife Australia. Birds have been observed foraging among the plantation species since June 2013. Visit the Bird surveys and Plot Monitoring pages to find out more about techniques applied and why monitoring is important as a benchmark for measuring success (or failure) and enabling adaptation.